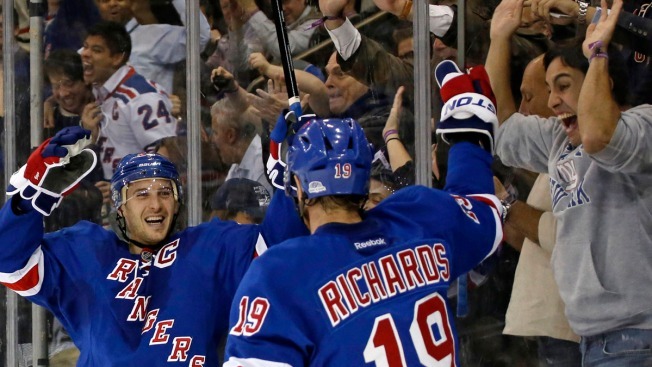 Rangers right wing Ryan Callahan, left, celebrates with center Brad Richards (19) after scoring a second period goal against the Pittsburgh Penguins in the Rangers 5-1 upset victory Wednesday. Brian Boyle scored his first goal of the season and Ryan Callahan added his first since returning from a broken thumb as the Rangers matched a season high in goals with a 5-1 victory over the Pittsburgh Penguins on Wednesday night. Pittsburgh had won four straight and defeated New York eight times in nine meetings, but Ryan McDonagh and Derek Stepan scored 1:05 apart late in the first period to put the Rangers ahead. Boyle and Callahan connected within a 2:28 span of the second to send New York to its fourth win in five games. Derick Brassard made it 5-1 at 9:57 of the third, and Brad Richards had two assists for New York, which rebounded from a 2-1 loss to Anaheim on Monday and completed a 3-1 homestand. Henrik Lundqvist made 28 saves. Kris Letang's power-play goal pulled the Penguins to 3-1 with 5:26 left in the second, but Callahan's fourth of the season — in his second game back in the lineup — restored the Rangers' three-goal lead 1:04 later. Marc-Andre Fleury, who sat out Pittsburgh's 3-0 win at Columbus on Saturday, stopped 20 shots. The Rangers (7-8) scored more than three goals for the second time this season but reached five for the second time in three games. Pittsburgh (11-5) fell to 4-3 on the road and allowed more than two goals for only the sixth time. New York led 2-0 when Richards found Boyle streaking down the middle of the Pittsburgh zone for a shot that got past Fleury with 6:50 remaining in the second. For the opening 18 minutes of the game, the Penguins had everything going their way. But despite controlling the puck and having multiple scoring chances, Pittsburgh remained locked in a scoreless tie. Then, in just more than a minute, the Rangers cashed in a pair and skated off with a stunning 2-0 lead. Boyle won a puck battle behind the Pittsburgh net and backhanded a pass into the left circle that McDonagh gathered before snapping off a shot that beat Fleury with 1:52 left in the first for his third goal. The Madison Square Garden crowd was still buzzing when the Rangers quickly made something out of nothing for another goal. The puck came out of the Pittsburgh zone, and Mats Zuccarello forced a Penguins turnover at center ice in front of the penalty boxes. Chris Kreider got the puck and gave it back to Zuccarello, who saw Stepan streaking into the Penguins end. Zuccarello flipped a lead pass back into the zone that Stepan chased down and deftly roofed into the net with 46.3 seconds left for his fourth goal. The Penguins finished the first with a 12-9 edge in shots, including a drive by defenseman Matt Niskanen that was deflected by teammate Pascal Dupuis and through Lundqvist. The goalie desperately reached behind him as the puck fluttered and rolled toward the goal line, but it was swept out of harm's way by Callahan with 6:32 left. About four minutes later, Craig Adams rang a shot off the right post behind Lundqvist.